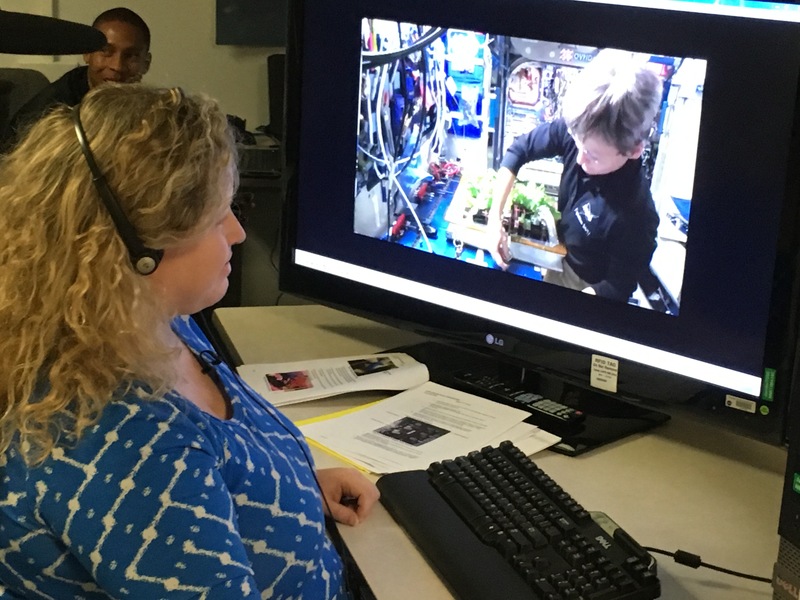 At Kennedy Space Center in Florida, Veggie Project Manager Nicole Dufour instructs astronaut Peggy Whitson during the first harvest of Chinese cabbage aboard the International Space Station last month. Today begins the grow out of the second Chinese cabbage crop aboard the orbiting laboratory. Today, astronaut Peggy Whitson will pull out her gardening tools once again to initiate the next crop of Chinese cabbage to be grown aboard the International Space Station. This crop will be the second Chinese cabbage and the sixth crop grown in the Veggie system. The leafy greens will be allowed to grow for two months while Whitson periodically harvests leaves for crew enjoyment as well as for science. This will be the second time a space station crew has used the cut-and-come-again harvest technique intended to increase crop yield; the technique was previously used with ’Outredgeous’ lettuce. This time around, the gardening guidance given to Whitson was revised to reflect the need for more water that was discovered during the first growth of Chinese cabbage earlier this year. According to Veggie Project Scientist Dr. Gioia Massa, every experiment provides new information as the Veggie team continues to lay the groundwork for future long-duration plant growth systems. Although these Chinese cabbage seeds are the last ones currently aboard the orbiting laboratory, the Veggie team does plan to send up more seed pillows in the near future. What seeds will those pillows contain? The team isn’t certain just yet, but the scientists have been studying peppers, tomatoes and other leafy greens. Stay tuned for more cosmic cuisine!